Ultra tasty, easy, tender and moist. 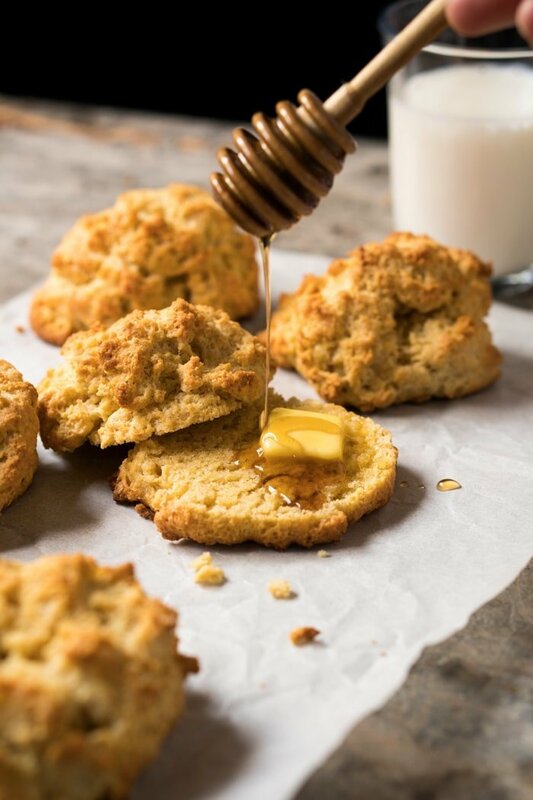 These gluten free, paleo and keto drop biscuits check all the right boxes! Whip them up in 30, for an awesome low carb bread that goes great with sweet and savory alike. These guys are essentially the lazy version of our mile-high flakey biscuits. Though unlike their fancier siblings, these guys work exceptionally well even without any dairy, so a paleo version is totally doable. Easy-peasy really, and easiest done in your food processor. You simply pulse the flours together, add the butter and pulse until pea-sized, mix in the liquids, and ‘drop’ onto a baking tray. Just note that the trick lies in keeping the butter pea-sized, and not blending it all together with the flours. These will ensure a light rather than super dense texture. But if no food processor is at hand, you can also ‘cut’ the butter into the flours with a pastry cutter, two knifes, or simply your cold fingertips. Work quickly, without melting the butter. Then you’ll simply pour in the egg mixture and mix with a two spoons until shaggy. There’s a reason classics become classics, and so the butter and sour cream version is more akin to tradition (and my favorite). But if paleo, or dairy is out of the question, the coconut oil and cream version is also delicious in it’s own right. And you can also use ghee. Possible subs, and amount adjustments, are listed next to the ‘main ingredients’ in the recipe card. Almond flour. You truly need a super finely ground almond flour here, as if you use meal your biscuits will turn out dense and oily. Super fine almond flour brands include Anthony’s , WellBees and Bob’s. Flaxseed meal. You’ll want to use golden flaxseed meal (we use Bob’s), and regrind the flakes in your (very dry!) bullet or blender until finely powdered. Great way to avoid slimy breads. If intolerant to flax, you can use finely ground psyllium husk (these do best allowing them to cool for 20 mins before serving). Coconut flour. We favor Anthony’s, but Bob’s works great too. Whey protein isolate. This one helps to get a fluffier and lighter texture. Keep in mind that this ingredient varies tremendously from brand to brand, and we’ve only tried (and are super happy!) with Isopure’s Zero Carb Unflavored. You can substitute it with more almond flour, just keep in mind your biscuits will be a tad denser. Xanthan gum. Borrowed from molecular cooking, xanthan gum is the binding agent which makes your toothpaste jelly-like (and your cream cheese, well cream cheese-like). And it’s also the most common gluten-replacer in gluten free baking. And while we do prefer the results with it, you can sub it with twice the amount of flaxseed meal- not a huge deal here. Preheat oven to 450°F/230°C. Line a baking tray with parchment paper or a baking mat. Add eggs, sour (or coconut) cream, water and apple cider vinegar to a medium bowl and whisk for a minute or two until fully mixed. Set aside. Add almond flour, flaxseed meal, coconut flour, whey protein, baking powder, xanthan gum (or more flax) and kosher salt to a food processor and pulse until very thoroughly combined. Add in the butter and pulse a few times until pea-sized. Pour in the egg and cream mixture, pulsing until combined. The dough will be very shaggy. Drop 6 rounds of dough onto the prepared baking tray. Brush with melted butter and bake for 15-20 minutes until deep golden. Allow to cool for 10 minutes before serving. These guys keep well, stored in an airtight container at room temperature, for 3-4 days. You can freeze the shaped biscuit dough for 1-2 months, and bake straight from the freezer as needed. Please see post for deets, possible subs, and methodology without a food processor. We found each batch to yield 6 biscuits, and nutrition facts were estimated per biscuit. Hi, I just made these. Everything is great except the metallic after taste. Did I do something wrong? The cups conversion link doesn’t work in this recipe. Can I make them smaller and use them as dumplings to be cooked on top of my chicken soup? You are a Goddess! 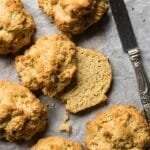 I’ve been thrilled with the results of your recipes and have wanted a good gluten free, keto biscuit. I’ve made some with carbquik, which are fine, but some of my friends at work are gluten free. I am sooooo glad you give great alternatives to fathead doughs or the cheese based biscuits I usually see. I’m not a fan of those, but guess they have their place. So, Thank You, Thank You, Thank You for sharing. I just made these and, OMG. These really are biscuits! Will definitely add some garlic powder and cheddar to my next batch! Just a note, I always bake with unsalted butter and even though the recipe does call for a little salt, I felt they could use a little more. Nothing smearing a little salted butter on them wont fix! Thank you, Paola! There’s a reason I’ve made several of your recipes this week. 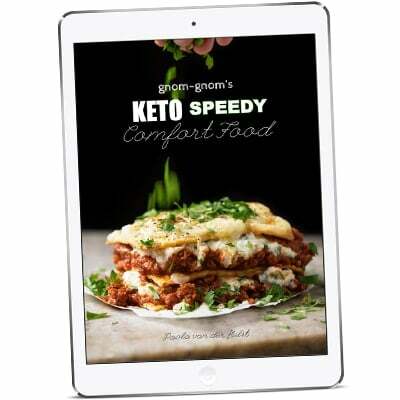 Yours are turning out to be the best keto recipes on the web! They are great..! I baked them for 10 min and they almost burned but still good. Also, for the the sour/coconut cream + vinegar ingredient. In this recipe I notice you have 2 tsp and in the new ebook you have 1 Tbsp. I used 2 tsp this time and wanted to know if that is an update in the book and which is best in your opinion? I am allergic to almonds, any non-nut substitute for the almond flour this one? Sunflower seed flour is a common almond flour sub xo! This is the forth recipe I’ve made of yours in less than 2 weeks and I’m so impressed. I don’t how you figured out how to make these gluten-free flours behave this way, but I wish I would’ve found your site a year & a half ago. 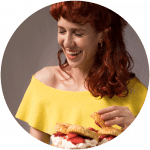 I’ve gone off my keto diet several times over the past year because I’ve felt deprived of foods that I love (unfortunately I’m a big foodie). I wish I didn’t have to go to work so I could make your recipes all day. Just had a biscuit with butter and jam with breakfast. Awesome!!! I made these biscuits for dinner tonight and wow! What a treat dinner was! These were perfectly dense and fluffy at the same time. I did added 1tsp of vital wheat gluten and it seemed to let them rise a bit better. The crumb was perfect with crunchy bits (crisp) outside and bready yummy interior. Do you think you could do a twist on this with using mayo as the fat? BTW, thanks so much for this recipe!! It’s definitely a keeper! OH man I’ve no idea about mayo biscuits! I hadn’t heard of it until now, but I’ll def dig up on it (I love so much when you guys share things like this!). xo!! OH my god.. these were so damn good. I was dubious making them – I usually can’t stand anything made with coconut flour but the little bit in there doesn’t really register after they are baked. These have the same texture as the tea biscuits my grandmother used to make. 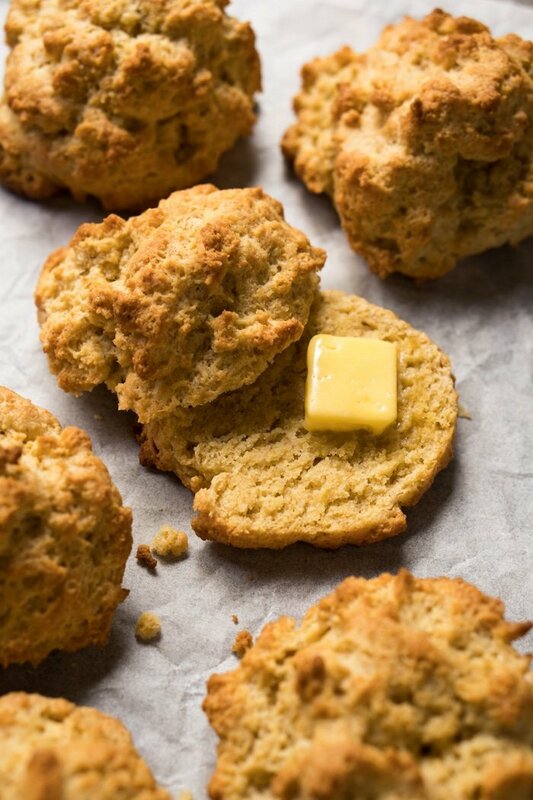 They are flakey, dense and buttery – just a perfect biscuit. With a touch of sweetener and some strawberries, or sf chocolate chips and they would be the perfect keto scone. Thank you so much for this recipe, it truly is a winner. 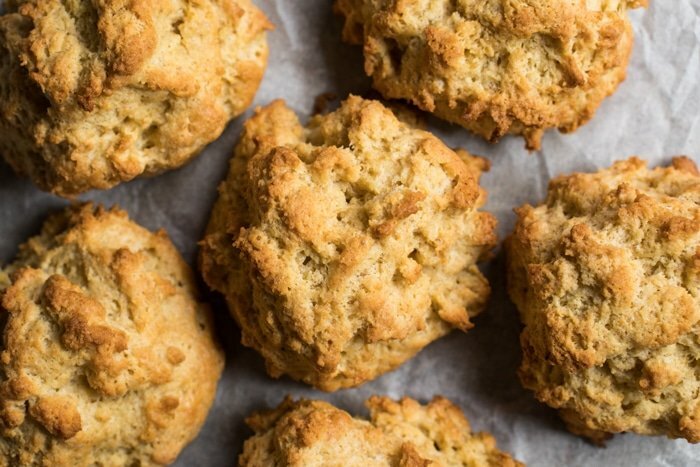 I am a southerner who grew up eating biscuits so this recipe was a MAJOR game changer for me as they are the very best LC and GF biscuits I’ve had since going GFLC 4.5 years ago. I don’t miss biscuits anymore thanks to these, plus they are so easy to make! I make a double batch, scoop and lightly pat with wet fingers onto parchment paper, then freeze. They are so tender, just perfect. Thank you, you are my go to for all baking recipes! Between this and your bread recipe, you have changed my weekly menu options. Very grateful for your baking knowledge and your willingness to share your work…. PS, your bread recipe alone got me to buy your cookbook! Regarding flaxseed, there is a big difference in the color and slight difference in mouthfeel between golden and brown flaxseed. I know you mention it in the body of the page, but not in the recipe details. I’d recommend just saying “golden flaxseed meal” everywhere. My biscuits, while still really great, turned out quite a bit darker than the ones in your pictures due to that. Ditto on the pizza crust recipe. Hi KS! Yeah, you definitely want to use golden! And that is a great suggestion so I just changed added the golden to all the recipe cards to make sure peeps don’t miss it (thanks!) xo! Would these cook all right dropping them in to a pot of broth instead of in the oven? I’m thinking chicken and dumplings style. No, you never want to cook grain free flours in water (they become mushy rather than cooked)- think blanched almonds. They do work baked as cobbler, but they’re not cooked inside water. THIS RECIPE IS LIFE!!!! I have been getting so discouraged recently with keto baking because everything has been coming out so weird tasting. This is the second recipe I’ve made from here and have rediscovered my love of baking! I can’t even tell that this is a “Keto” recipe. Even my boyfriend who is afraid of keto baked goods loved them. Thanks! I loved this recipe and especially appreciated how easy it is. The 2nd time I made it I tried a variation I thought you might be interested in. To your basic dough recipe, I added 2 tbsp swerve and 6 tbsp fresh blueberries…to make blueberry biscuits. Just a hint of sweetness and it only adds 1 additional net carb per serving. 🙂 I took a pic for you but don’t see a place to add it on the comment section. Anyway, thanks for this!! These were the best keto biscuits I’ve ever made! 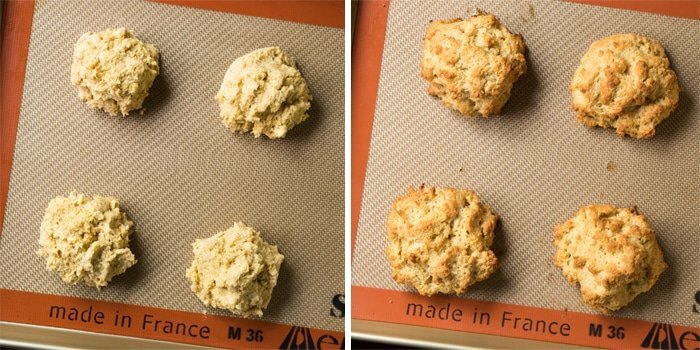 Thanks so much, I’ve been trying to find a really good biscuit recipe for years! Oh yay Solora that’s so awesome to hear :)! Thanks so much for reporting back! I made these yummy biscuits today and saw that the recipe called for one egg, but in the directions it says to add the eggs. Just wanting to double check that there’s only supposed to be one egg, right? Can glucomannan be used instead of xanthan gum? And, do you have an archive? I just found your site today and love it. Hi Donna! Unfortunately no, xanthan and glucomannan don’t work the same way when baking. But flaxseed meal is a better sub. You can check out the entire recipe index by clicking on ‘recipes’ in the header menu. Enjoy 😉 xo! Sooo…my bread came out a grayish color. What did I do wrong? Hi Kathleen! I can’t think of anything else other than a variation in the flours you used (they vary a lot from brand to brand!). My first thought is that your flaxseed meal isn’t the golden variety. xo! Hello! Did you use psyillum husk powder? I know a lot of brands can make the food turn purple or grey, it shouldn’t affect the taste. Just made these. They are so good. I love all of your recipes. That’s so awesome to hear Hellen! Hope you keep enjoying and thanks so much for reporting back :)! I’ve been looking at all of your recipes and I’m amazed. They look so delicious! I am wondering if you have ever tried making your sweets with “ just like sugar.” I’m struggling with the other sweetners. The aftertaste is tough. Hi Traci! That’s awesome to hear! Regarding ‘just like sugar’, in all honesty I’m not familiar with it. I just did a quick google and saw it’s made out of chicory root, though I haven’t baked with it yet so unfortunately I can’t be much help. Have you tried xylitol too? I find that one has no after taste at all for me. xo! Best keto bread I’ve tried to date! They’re delicious my goodness!!! Hi..really wanted to try these today but the fat content gave me pause as it’s almost 1/3rd my day’s allowance. How would reducing the butter to half impact the final product? How big are the biscuits and do they spread on baking? Thanks. Hi Sonia! Keep in mind that biscuits, scones, pie crusts etc are ‘fatty breads’. And also that much of the fat is also coming from the keto flours (almond & flax!). You can see in the pics that they do fluff up, and halving the butter would definitely impact the final product as you’re altering the ratios (less fluffy, flakey etc). I think your best bet is to make something like the tortillas which don’t have extra added fat other than from the flours. xo! Hi Paola. Another great recipe! I just have one question. What do you mean when you say, “The dough will be very shaggy.” Thanks.